Hollywood Freeway over the Four-Level Interchange ("The Stack"), 1953. Courtesy of the California Dept. of Transportation. Commercial airlines begin moving their operations from Lockheed Air Terminal in Burbank (present-day Hollywood Burbank Airport) to Los Angeles Airport (present-day Los Angeles International Airport, LAX). Located in Downey, Los Angeles County opens its first publicly-funded animal shelter. Beacon Light Used at Los Angeles Airport (present-day LAX), 1945. Los Angeles Almanac Photo. The Cleveland Rams professional football team begins playing in Los Angeles. About 1,500 war veterans camp out in MacArthur Park to protest the housing shortage in Los Angeles. The Los Angeles State and County Arboretum opens. The "Hollywood Ten," seven writers, two directors, and one producer, are charged with contempt of Congress for their refusal to state whether they are Communists. The Hollywood Freeway (101) opens. One of the most infamous crimes in Los Angeles history occurs, the "Black Dahlia" murder. Mobster "Bugsy" Siegel is gunned down at the home of his girlfriend Virginia Hill in Beverly Hills. Plans are revealed for the world's first "four-level grade separation" near downtown Los Angeles, connecting the 101 (Hollywood) and 110 (Harbor and Pasadena) freeways. Los Angeles County begins using telephone area code 213. The Los Angeles County Air Pollution Control District is formed to fight the worsening smog. Elizabeth Short, also known as the "Black Dahlia," in a 1943 Santa Barbara PD photo. Courtesy of Wikimedia Commons. The Los Angeles City government fires 17 city workers when they refuse to sign loyalty pledges. The Pacific Electric Railway Company asks the Public Utilities Commission for permission to replace its famous "Red Cars" with buses on 11 of its 17 lines. Ed Roybal becomes the first Mexican American to be elected to the Los Angeles City Council since 1881. The Los Angeles Airport is renamed to Los Angeles International Airport (LAX). U.S. Congressman Edward R. Roybal. Courtesy of Library of Congress. 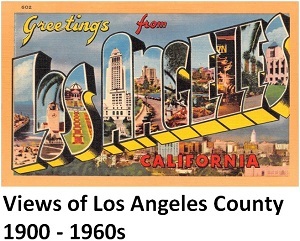 The U.S. Census records 1,970,358 people in the City of Los Angeles and 4,151,687 people for all Los Angeles County. Louis H. Boyer begins the largest private land development in the nation with a plan for the 17,000-home community of Lakewood. Los Angeles area Congressman (and future President) Richard Nixon wins a U.S. Senate seat in a campaign against Congresswoman Helen Gahagin Douglas. Congressman Richard Nixon campaigns for the U.S. Senate, 1950. Courtesy of National Archives. Backyard incinerators are banned in an attempt to reduce smog. Seven Mexican American youths are arrested and beaten by Los Angeles police officers in an incident that becomes known as "Bloody Christmas." Eight officers are later indicted and 36 others are disciplined. The Metropolitan Transit Authority is established. The Los Angeles Rams win their first NFL championship in Los Angeles. Nevada atomic test 225 miles away observed from Mt. Wilson by Caltech students Stan Wilks & Dave Twining. Photo by Los Angeles Mirror, courtesy of the U.S. Dept. of Energy National Archives. A major earthquake centered in Kern County jolts Los Angeles, but heavy damage is limited here due to the distance from the epicenter. At least five people are killed. Professor Arie J. Haagen-Smit of the California Institute of Technology first explains conclusively the origins of smog. The Los Angeles City Housing Authority comes under investigation by the California State Un-American Activities Committee. Local congressman Richard Nixon is elected Vice President. U.S. Air Force Plant 42 is established in Palmdale. Aerial View of U.S. Air Force Plant 42. Courtesy of U.S. Geological Survey via Topoquest.com. The El Pueblo de Los Angeles State Monument is dedicated. The Pacific Electric Railway cedes control of its bus and red car lines to Metropolitan Coach Lines. The "Four Level" interchange near downtown Los Angeles is completed. The Sepulveda Boulevard underpass running beneath the LAX runways is opened. It is the first tunnel of its kind. The first successful cross channel swim from the mainland to Catalina is made by Jose Cortinas in, 32 hours, 10 minutes, 52 seconds. Four-Level-Interchange, 1953. Courtesy of the California Department of Transportation. Lakewood is incorporated as a city. Los Angeles is hit by its worst ever smog attack, causing air traffic to be diverted from LAX to Burbank and preventing ships from entering the harbor. The J. Paul Getty Museum opens. Simon Rodia completes the Watts Towers. Los Angeles City Mayor C. Norris Poulson, although not favorable to racial integration, but facing the inevitability of a racial discrimination lawsuit by the NAACP, orders desegregation of the Los Angeles Fire Department. The move is made against a good deal of opposition by some rank-and-file white firefighters. Two postal employees are charged as operating large bookmaking operations out of the Terminal Annex Post Office in Downtown Los Angeles. About a dozen other postal employees were alleged to be involved. Watts Towers by Simon Rodia. Los Angeles Almanac Photo. The Walt Disney Company opens Disneyland in Anaheim. Disneyland Entrance, Anaheim, California. Courtesy of the Carol M. Highsmith Archive & Library of Congress. Baldwin Park, Cerritos La Puente and Downey are incorporated as cities. Los Angeles City lifts its ordinance limiting building heights to 150 feet. California State University at Northridge is established. Los Angeles City Hall, 1945. Airscapes photo by War Department, courtesy of National Archives. Rolling Hills, Paramount, Santa Fe Springs, Industry, Bradbury, Irwindale, Duarte, Norwalk, Bellflower and Rolling Hills Estates are incorporated as cities. These ten cities are the largest number of new cities incorporated in Los Angeles County in a single year. After colliding midair with a military jet aircraft, a new DC7B airliner on its first test flight out of Santa Monica Airport crashes into Pacoima Congregational Church in Pacoima with large portions of the wreckage falling into the adjacent playground of Junior High School in Pacoima. The crew of both aircraft are killed, as are two school children on the ground. A third seriously injured child dies a few days later. At least 75 other children at the school are injured. The Brooklyn Dodgers move to Los Angeles. Northern Los Angeles County begins using telephone area code 805. The Whittier Narrows Dam is completed. Whittier Narrows Dam project, 1957. Courtesy of U.S. Army Corps of Engineers & USC Library. Pico Rivera and South El Monte are incorporated as cities. 78,672 people pack the Los Angeles Coliseum to see the new Los Angeles Dodgers play the San Francisco Giants. The Dodgers win 6-5 (April 18). The remnants of the former Pacific Electric Railway (including the Red Cars) are placed under the control of the newly created Los Angeles Metropolitan Transit Authority. KTLA Channel 5 introduces the first TV news helicopter in the nation in Los Angeles. It is known as the "Telecopter." The first successful double cross channel swim between the mainland and Catalina is made by Greta Anderson (Catalina to Mainland: 10 hours, 49 minutes, 41 seconds; Mainland to Catalina: 26 hours, 53 minutes, 28 seconds). Walnut, Artesia, Rosemead and Lawndale are incorporated as cities. Soviet Premier Nikita Khrushchev visits Los Angeles. Local real estate agents attempt to sell him a home. The Los Angeles Dodgers defeat the Chicago White Sox to win their first World Series pennant. United Airlines begins the first jet service at Los Angeles International Airport (LAX). The jet route links Los Angeles and New York. The Los Angeles Memorial Sports Arena opens. Los Angeles Dodgers versus Chicago White Sox in a World Series Game at Los Angeles Memorial Coliseum, 1959. The Sporting News Archives, courtesy of Wikimedia Commons. Commerce, La Mirada, Temple City, San Dimas and Cudahy are incorporated as cities. The U.S. Census records 2,479,015 people in the City of Los Angeles and 6,039,834 people for all Los Angeles County. The Democratic National Convention is held in Los Angeles. John F. Kennedy is nominated as the Democratic candidate for President. The Lakers professional basketball team moves from Minneapolis to Los Angeles. John F. Kennedy accepting the presidential nonimation at the Democratic Convention in Los Angeles, 1960. Courtesy of San Jose News & Wikimedia Commons. Bell Gardens and Hidden Hills are incorporated as cities. The Great Bel Air-Brentwood Fire destroys 484 homes in the worst brush fire in Los Angeles history. The Theme Building is built at Los Angeles International Airport (LAX). The Los Angeles City Council later designates it in 1992 as a cultural and historical monument. The last of the old Red Car trolley lines, the Los Angeles to Long Beach line, ceases operations. Theme Building at Los Angeles International Airport (LAX). Courtesy of Junkyardsparkle, photographer & Wikimedia Commons. Palmdale is incorporated as a city. The Lakers appear in their first NBA Championship series as the Los Angeles Lakers, but are defeated by the Boston Celtics, 4 games to 3. Dodger Stadium is opened in Chavez Ravine. Hearst Corporation merges two of its newspapers in Los Angeles, the Los Angeles Examiner (founded 1903) and the Los Angeles Herald-Express (founded 1873) to become the Los Angeles Herald-Examiner. Dodger Stadium, Los Angeles, California. Courtesy of the Jon B. Lovelace Collection of California Photographs in Carol M. Highsmith's America Project & Library of Congress.